The formal structure of the management of the flock was put in place shortly after the sheep dyke was completed. An agreement was worked out between the laird at the time, John Traill of Woodwick, and the island crofters, whereby the occupants of each croft would have a right to put a fixed number of sheep on the beach, in return for agreeing to look after the maintenance of the sheep-dyke and obey rules of flock management. The sheep regulations were updated at various stages, and a version presented to the Crofters Commission when it visited the island in the summer of 1893. 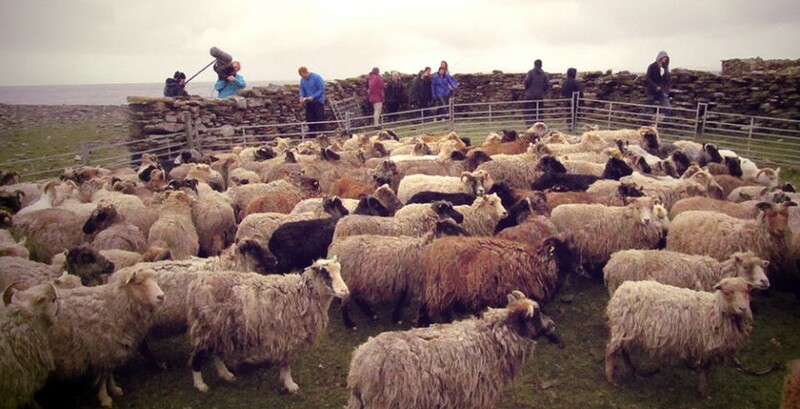 ”(1) There are 71 crofts or farms on the island of North Ronaldsay. Crofters or others are allowed to keep from 10 to 60 sheep each according to the size of their holding. Six non-tenants are allowed to have a total of 65 sheep. It is hardly conceivable that such a large flock as 2,250 sheep can be maintained on seaweed and confined to the island beaches, living on the outside of a surrounding dyke (12 to 13 miles long) which partitions their sheeprun from the cultivated part of the island. (8) Two Sheepmen from each of the five Toonships shall be elected in order to carry out and enforce the Sheep regulations. At several times of the year the sheep are gathered together and ‘punded’.